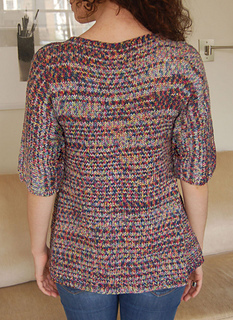 This one piece, top-down, A-line sweater, with a round neck and elbow length sleeves, has tapered side gussets in reverse St st.
Back of sleeves are knitted with back of sweater, and sleeve fronts are knitted with front of sweater. 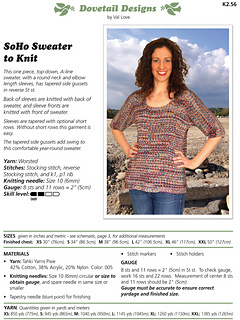 Sleeves are tapered with optional short rows. Without short rows this garment is easy. The tapered side gussets add swing to this comfortable year-round sweater.